Share Portage and Main's EPK! On the eve of a tour that sees them heading south to California, The Sumner Brothers gathered a few friends to kick things off at The Cobalt. Surprisingly, it was my first time at the venue (or maybe not, since they used to be known more for punk), but I quite liked it. It had... character, but also great sight lines and pretty good sound. First up was Rolla Olak, who took the stage alone. He has a folky-blues sound, which set the tone for the night. His songs were good, and well written, but nothing that really jumped out to grab you, but still Perfectly Acceptable Music that was definitely enjoyable. Though while the music was good, there wasn't much in terms of stage presence. He was just up there playing, not very much crowd interaction, or banter; he didn't even say who he was at any point during the set. There was, though, an offhand mention of having a full band, and I would be interested to see that. He was okay on his own, but I can see the songs sounding a lot better with a full band to round them out. Next up was Steve Brockley, who had more of a country edge, with a bit of a bluesgrass feel as well. Their set was mostly a slower tempo, but there were a few songs that were a bit more driven, and the band definitely sounded better when they had more energy. The highlight of the set was the closing song, which was a perfect example of that, exploding into an all out a frantic ending. Their songs were all pretty catchy, but more than a couple of them seemed a little familiar -- not like they were ripping anyone off, but you could clearly tell a few influences. Like Olak, they were enjoyable to watch, but nothing really spectacular. Hitting the stage third was The Sumner Brothers. I've seen them a couple times now, and the one thing that always strikes me is their intensity. There were songs where Brian Sumner was singing through grit teeth, and the whole band just oozes energy on stage. In fact, this time they seemed to be even more energetic and intense than previously. They had a bit of what can only be described as death country (I could see them opening up for Elliott BROOD no problem), with the two brothers, Bob and Brian trading off vocals for some insanely catchy and toe-tapping songs. As well as their own, they threw in their usual cover of Neil Young's “Hey Hey My My (Into the Black)”, and while the set almost ended on a bit of a sadder song, they spontaneously decided to add one more, their own high energy version of the traditional “Pay Me My Money Down”. Probably the best set I've seen from the band, and a great kickoff to their tour. It was almost 1am by the time they hit the stage, but there was still a decent size crowd for Portage & Main, capping off the night. They had just returned home from a short western tour, and within the first two songs, I could tell how much they improved over that time. Tight and energetic, with more confidence than the last couple times I'd seen them live; more comfortable on stage and with each other. And with the crowd, too, as they seemed to have a bit more banter and joking around. Even when the “Curse of the Capo”, as they called it, hit during “Rocky Mountain Wanderer” -- the capo popped off John's guitar -- they didn't let it slow them down. They hit most of the songs off their self-titled debut, from barnburners like “What Have I Done” and Tonight pt 2” to the more slower, softer “Song For My Mom”, and even a cover of Rolling Stones' “Dead Flowers”. They capped off the night with one of my favourites from the album, the building energy of “ I'd Never Climbed a Mountain” and then “Carolina”, which is destined to be a great bar room sing-a-long song. It was a really good show, overall, with all the bands complimenting each other quite well. Especially Portage & Main and The Sumner Brothers (who I had seen play together once before). If opening act Adrian Glynn was going to be any indication of Friday’s three-band soiree at the Anza Club, we were in for an evening of true folk entertainment and storytelling; and along with Glynn, both the Sumner Brothers and budding band Portage and Main, who were celebrating their CD release, delivered just that. Glynn put on an eerily electrifying one-man show, as he seamlessly managed a looped drum track that punctuated his flawless chords and arpeggios. Crowd members were silently transfixed by Glynn’s ability to carry the show alone. That was until the solo songwriter ended his set with a camp-style song that had the audience singing along, showing that they weren’t exactly first-time listeners. By the time the ever-eclectic Sumner Brothers took stage, the venue had filled to capacity. Despite the room being cramped with potentially unruly drunks, the boys had no trouble captivating the audience once again. Pulling off the difficult feat of covering the great Neil Young, the guys played a down-tempo version of “Hey Hey, My My” that was carried by bassist Mike Agranovich’s impeccable style and timing, and Brian Sumner’s gravelly vocals reminiscent of Tom Waits. Crowd-pleasers like “Cannery Row” and “Last Night I got Drunk” showcased the boys’ diverse talents, but their extended set had us waiting on the night’s feature—Portage and Main. The five-piece kicked off their awe-inspiring set with the partially folksy “Settle Down,” inviting singer Savannah Wellman to the stage to compliment lead guitarists and vocalists Harold Donnelly and John Sponarski. After a few lively numbers—some reminiscent of mid-‘90s post-grunge (think Counting Crows with a rootsy inclination)—Sponarski slowed it down with the heartfelt “When You’re Gone,” a song he dedicated to his sister. Donnelly and Sponarski’s vocal harmonies blended seamlessly, except when the immensely talented Donnelly sang solo, exhibiting his vocal control. Portage and Main wowed the crowd with some shoe-gaze-ier songs, but picked up the tempo near the end with “I’d Never Climbed a Mountain”—showing that the guys’ true calling is their penchant for folk with a country swagger. With a band name such as Portage and Main, you’re forgiven to assume that the geographic location for the beginnings of said band would have been in Winnipeg, where this popular intersection of streets in the heart of the city is nearly iconic. However, the alt-country, folk rock duo of John Sponarski and Harold Donnelly was formed in the heart of the damp, downtown Vancouver, far from the lazy prairie winds of Manitoba. Why does this all of this matter? As much as it has nothing to do with music, it actually does. You see, when you listen to this ambitious, self-titled debut album by these two folk nomads (accompanied by Georges Couling on keys, Ben Brown on drums, and Mike Agranovich on bass), it may very well do for you what it did for me: conjure up images of long, dusty roads, wheat fields, meandering streams, rocky mountains and camp fires. Much different than the concrete jungle of the greater Vancouver area, where, wheat fields and dusty roads are centuries past, and where this album was written. It’s hard to ignore the nature aspect of the album with track titles such as I’d Never Climbed A Mountain and Rocky Mountain Wanderer, the latter of which lyrically paints a picturesque landscape quite poignantly, and effectively. 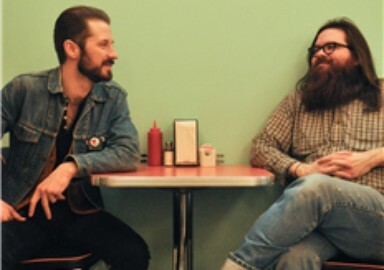 As Portage and Main may very well be a reincarnation of The Band, or an embodiment of all that is Neil Young‘s Harvest Moon, they still have a musical approach that is without comparison. For instance, the absolutely beautiful harmonizing on Song For My Mom, which features backing vocal harmonies by Redbird‘s Savannah Leigh Wellman, should not be subdued to comparison, for it is great enough to stand alone. This isn’t the only song which features fantastic two and three part harmonies, truth be told. You’ll be hard-pressed to find a song lacking perfect harmonies on this album as they are all tight and nicely orchestrated. Tight, beautiful harmonies are abundant, but so are great guitar licks. In fact, (warning: another comparison, sorry!) Mr. Sponarski’s guitar tone and licks in What Have I Done are so Mark Knopfler-esque, it’s as admirable as it is enviable. I don’t mean to take anything away from John’s guitar playing. The opposite, actually. Along with some lovely organ cascading in the background of this gem of a tune, What Have I Done is my favourite track on the album. It’s followed by another twangy, riff-laden intro to The Morning After. On only the third track of the album, Portage and Main have definitely gotten my attention. The rambunctious Tonight Pt. 2 is a rockin’, uptempo tune that will not leave your foot untapped. Again, some phenomenal guitar playing and great harmonies. And just incase you forgot where you should be when you listen to this song, the brief outro features only the crackling of a fire and the whistling of a boiling kettle. Well done, gentlemen. The album closes off with yet another great song, called Carolina, that yet again features great guitar tones, lovely harmonies and a twangy, alt-country sound that wouldn’t be out of place on The Black Crowes’ masterpiece The Southern and Musical Companion. So, a word of advice: if you are going on a road-trip this summer, this is the CD to buy. If you are going camping this summer, this is the CD to buy. If you need to bone up on practicing your harmonies, this is the CD to buy. This is a true piece of Canadiana rock, but don’t take my word for, listen for yourself here: http://portageandmainband.com/music/ and find out what I’m talking about. It’s no false notion that musicians are chick magnets. Give a girl a man with a voice and a guitar and she’ll swoon. Give her one that has no idea how talented he is and she’ll swoon harder. Such is the case with the boys in Vancouver’s own Portage and Main, a five-piece country-folk group of singing studs with talent and humility. 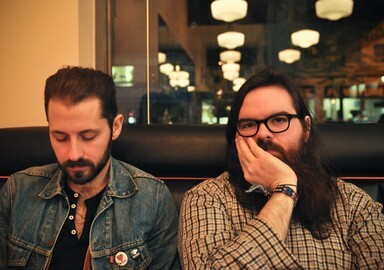 The band’s self-titled debut album is an unpretentious exploration of western-style songwriting, kicking off with the slow but triumphant “Nothing (Take What You Need)”, a four-minute ballad carried by the harmonizing vocals and melodic but twangy guitars of John Sponarski and Harold Donnelly. Songs like “The Morning After” and “I’m Going Down Tonight” showcase the boys’ classic country sensibilities, with swaggering rhythms kept by drummer Ben Brown and bassist Mike Agranovich. Rounded out by Georges Couling’s punctuating keyboards, the 12-track album serves up Americana glory. Not every tune on the disc is nostalgic for old-time country, though. “What Have I Done” is a partially poppy jam reminiscent of mid-’90s footnotes like the Counting Crows or Gin Blossoms. “Follow Me My Love” is more of the same, a catchy tune that exchanges the acoustic guitar for electric, while the folksy “I’d Never Climbed a Mountain” begs to be sung along to. The record ends with the standout “Carolina”, a song that teeters between wild shoegaze sounds and big band. It was early 2010 that John Sponarski and Harold Donnelly, geeking out over a new guitar pedal, haphazardly spawned their first song together. We didnt think much of it at the time, recalls Sponarski, but after a while, it seemed neither of us could get it our of our heads. The two simply couldnt ignore the potential of their musical union despite playing in a band at the time and got to work. What started as a single song captured on a handheld recorder quickly grew to a pool of over 20 that the pair wanted to catalog. Setting up shop in a basement, they got together with a few friends from the local scene and output what would become their self-titled 2011 debut. We didnt originally intend on doing much with it, Sponarski says, so imagine the bands surprise when, come their album release party, a line of people wrapped around the sold-out venue like a string on a tuning peg. The record drew a fair amount of attention to the band, landing them showcases at festivals including CMW and NXNE, an invitation to play on CBC Music and Greencouch Productions Tracks on Tracks train tour, support slots for contemporaries like Chad VanGaalen and The Dudes, and, most recently, a top-20 position in BCs prestigious PEAK Performance Project for a chance at a $102,700 grand prize. And while Sponarski and Donnelly remain the groups principal songwriters, the Portage and Main banner has expanded to include Georges Couling on keys and Sponarskis childhood friends Dave Gens and Ben Appenheimer on drums and bass, respectively. The 10 tracks that comprise the album benefit from clean, tasteful arrangements that relay the bands easily-relatable and endearing poetry. Be it the upbeat and dynamic numbers like Better Man and opener Never Had The Time or more subtle offerings like Oona Jean and breathtaking closer It Is You, rich acoustic strums and twangy, reverb-drenched picking sit beautifully atop a tight rhythmic foundation throughout, often accented with classic organ or piano leads and dreamy pedal steel that seemingly soars through the speakers. Portage and Main plan to spend plenty of time on the road in support of their latest, including a cross-Canada tour in early 2013. Were just putting one foot in front of the other, Sponarski says in summation. The last year of our lives has been magical  things weve done, experiences weve had... Were just continuing on this journey. Its fitting, then, that with Never Had The Time, Portage and Main have delivered a score that suits such adventures perfectly. Never Had The Time is the sophomore offering from Vancouver folk-rock quintet Portage and Main and, like the simple pleasures it so well accompanies, stunning in its mere simplicity. Blending the seasoned country-rock sensibilities and harmonies of, say, The Band and Blue Rodeo with the more contemporary alt-musings of acts like Wilco and Old 97s, Portage and Main have cemented a sound that spans decades but belongs to today. The 10 tracks that comprise the album benefit from clean, tasteful arrangements that relay the bands easily-relatable and endearing lyrics. Rich acoustic strums and twangy, reverb-drenched picking sit beautifully atop a tight rhythmic foundation throughout, often accented with classic organ or piano leads and dreamy pedal steel that seemingly soars through the speakers.